St. Martin Parish offers an online index search via the Clerk of Courts website. The Index contains marriage records from 08/04/1982 to the present, and others, such as property records. To inquire about subscribing to the service, call (337) 394-2210. 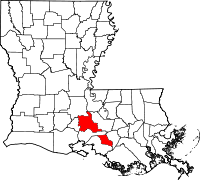 St. Martin Parish, part of the Lafayette Metropolitan Statistical Area, was, in fact, part of Iberia Parish until the area was split into its own parish in 1868. Part of the Atchafalaya National Wildlife Refuge is in St. Martin Parish, along with several other parishes. The Refuge is a 44,000 acre refuge that is located along the Mississippi River basin. This location has led to part of the refuge being closed to the public due to the recent flooding of the Mississippi, however St. Martin Parish has not been affected. The area is predominantly of French decent, and more people in the parish speak French than any other county in the U.S.